Good song, but sorry, not a great video. Tami Chynn uses the same dancehall riddim in her song Hyperventilating. That is actually a better song and even better video. 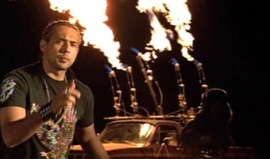 Sean Paul even makes a cameo in it. Get that video instead. dude I dont know what the hell that one girl said at the beggining about this music video being all cheap cuz its hotter than her and is seriously really awsome. I would just say that some of the outfits are a little exagerated though but still hot. Sean Paul and his girls burnin' something! This video may be cheap, but the song is great, and Sean Paul HAS to be burning something!